Japan Food Channel recently released an instructional ebook, "How to Make Sushi." The free book features sushi recipes that are practical and easy for the average person to make at home. This is the go-to book that breaks down what home chefs need to do step by step in the kitchen to make sushi successfully and have a good time while doing it. Japan Food Channel is excited to announce the release of a comprehensive free ebook entitled "How to Make Sushi: The Basics." The book is currently available for download at http://www.japanfoodchannel.com/FreeHowToMakeSushiCookbook. "How to Make Sushi" features popular, high-quality sushi recipes that are fun, easy to make and kitchen-tested by regular people. 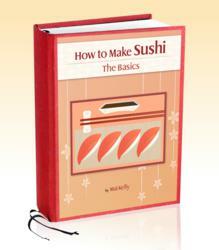 The book comes with a variety of practical tools that make it a complete guide to making sushi. For example, all of the sushi recipes link to tutorial videos that readers can watch for further guidance if they need it. There’s also a shopping guide available for people to use as a visual resource on their smartphone when they go shopping for ingredients that may be foreign to them. For a two-minute tour of how this interactive cookbook makes it easy for anyone to learn how to make sushi at home, click here. "How to Make Sushi" is a very distinctive interactive sushi recipe book. It focuses directly on what readers need to do in the kitchen without weighing them down with the complex history of sushi or all the different nuances of Japanese culture. “This is the go-to book that breaks down what home chefs need to do step by step in the kitchen to make sushi successfully and have a good time while doing it,” Mai said. "How to Make Sushi" contains recipes developed by Mai Kelly, an accomplished home cook who loves sharing her knowledge of Japanese cuisine and culture. The recipes presented in the book are based on workshops she and her husband, Drew, had held in their home to make it easy for people to learn how to make sushi. "How to Make Sushi: The Basics" is a manifestation of their love of people, cooking and teaching. “We’ve worked really hard to demystify everything in our kitchen, and all of those hours and sessions are culminated in this book,” Mai said. In addition to their sushi interactive recipe book, Mai offers a complete online learning center at JapanFoodChannel.com. The site includes a blog that gives some personal history about the highlighted dishes and tells how Mai learned to cook them. It also shares interesting stories about the kitchen where Mai grew up cooking next to her mom. Japan Food Channel also has numerous YouTube tutorial videos on Japanese food and sushi recipes. The videos are based on “live” cooking workshops, in which the Kellys provide insightful, hands-on instruction. “We answer all the common questions and keep no secrets from our students,” Mai said. In the coming months, Mai will be releasing two new recipe books. One will feature her original recipes for rolls, and the other will contain traditional Japanese cuisine straight from her family’s kitchen. For more information about "How to Make Sushi: The Basics" or Japan Food Channel, please visit http://www.japanfoodchannel.com. Or contact Mai Kelly at http://japanfoodchannel.com/contact-us/. Mai and Drew Kelly are passionate about sharing their love for Japanese culture and cooking. The Kellys began hosting sushi-making dinner parties as a way to have fun and entertain guests in their home. The popularity of their group cooking sessions steadily grew. This prompted them to create video tutorials, which became an instant hit and were viewed by thousands of people daily on YouTube. Eventually, the couple launched a blog, newsletter and the new "How to Make Sushi" ebook to further their efforts to share practical, fun ways to make sushi recipes at home. The Kellys are based in West Bloomfield, Mich.